Lawrence Berkeley National Laboratory have developed a way to generate power using harmless viruses that convert mechanical energy into electricity. things. 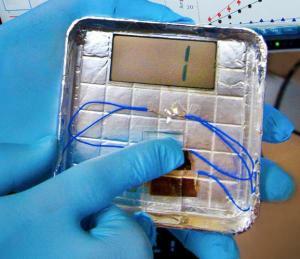 The Berkeley researchers developed an electrode approximately the size of a postage stamp. They coated the electrode with a specially engineered harmless viruses that, when tapped with a finger, generated enough electricity to power a small LCD display. discovered in 1880. According to Wikipedia piezoelectricity is: “the charge that accumulates in certain solid materials (notably crystals, certain ceramics, and biological matter such as bone, DNA and various proteins) in response to applied mechanical stress.” Stress could be pressure of vibrations. The word piezoelectricity means electricity resulting from pressure. Some of the devices that use piezoelectricity are electric cigarette lighters and scanning probe microscopes, but this is the first time it has been generated by biological materials. bacteriophage only attacks bacteria and is not harmful to people. there’s always a steady supply. It’s easy to genetically engineer and the viruses arrange themselves into an orderly film. These are the traits that scientists look out for. The results are promising, but according to Berkeley researcher Seung-Wuk Lee further research is needed. In future the technique might be used in our shoes, or on our doors or in some of the other objects that (we) move frequently during a day. The result of the research was published in the journal Nature Nanotechnology.